Waterproof, permanent and fast drying on most porous and non-porous surfaces. Available in Black, Blue, Bright Blue, Brown, Green, Orange, Red, White and Yellow in either US Gallon or US Quart Sizes. 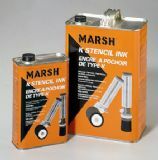 Remember to order Marsh Rolmark Solvent for equipment cleaning after use.